You'll see most temperatures are around 15 to 18 degrees for the Dunedin area. I believe Phil says that eventually miss-reading stations will be weeded out but I'm a bit powerless to do anything about that at the moment. The best bet is look at the live observation map and you'll see where temperatures are roughly reading, if anything looks a bit wild and out of place then it's probably reading incorrectly. Hi. How much rain do you see invercargill getting next few days, I see sat night Sunday looks promising? Getting dry. The next few days are just the odd shower which probably won't do much, you are right Sunday looks more promising with atleast 5 to 10mm proged, 15mm perhaps if you're lucky. It was never going to be a totally sunny afternoon or anything like that, just cloud breaking to "some" sun. It should improve a little further for the remainder of this afternoon. Tomorrow sees a similar pattern although hopefully it'll be brighter in the afternoon then it has been today. Thursday and Friday look to have areas of cloud but some sun at times. Saturday may be a bit brighter again. Not a totally sunny week but yeah, tomorrow afternoon will hopefully be better for you. Happy New Year to you guys at Weatherwatch. Thank you for the awesome job you guys did in 2018. Here's to another equally awesome job of accurate weather forecasting in 2019. Cheers to Phil, Aaron and the rest of the team. A.C.
That's half a month away basically, I can't really give you any useful information at this point in time as to what is going to happen then. The longest of the long range maps show a pattern alternating between anticyclones and then fronts moving through from the west / southwest. The exact timing of these fronts I can't tell you at the moment. As for temperatures perhaps alternating between periods of cool then warm, once again that's very vague and nothing specific. Have a good holiday, feel free to come back and ask 5 to 7 days out, might have a better idea then. That's probably a bit too far out for me to tell you anything of use at the moment, current indications are there may be some rain around then but that will likely change in model information as the 12th draws nearer. How that will change I'm not sure, it could end up being dry, it could be that rain arrives early on that day but clears by evening, or it could be dry then rain arrives in the evening. It's a bit futile at this point unfortunately. Are the any tropical cyclones that are expected to form in the south pacific in the near future? Keep an eye out for Dave's comments - he is usually on top of this sort of thing. Perhaps early January, but at this stage it's staying away from New Zealand way up in the tropics. Is there the possibilty of any exciting weather in CHCH in the future (i.e Thunderstorms, heavy rain, extreme heat, extreme wind). By the looks of things nothing too extreme apart from temperatures, they may be quite warm from tomorrow perhaps getting into the late twenties or early thirties if conditions suit. Friday looks mostly sunny, just watch for the risk of an isolated shower late afternoon / evening. Saturday sees slightly cloudier skies, some sun still about at times though. Once again an isolated shower or two possible mainly late afternoon / evening. Sunday sees a mix of sun and cloud, mainly dry with westerlies at this stage. So it's an improvement over what we have currently that's for sure. Still could be a pesky shower or two about however. Thunder heard over the Waitakere ranges just after 12:40. Hopefully not a sign of things to come over the next few days. Phil, Aaron and the rest of the WW team, have a great Christmas and New Year. You guys do an incredible job! You have a great Christmas and New Year's too. Could be some thunder Xmas afternoon, but you never know the nature of thunderstorms are they are often quite isolated so no garantuees you will get them, we'll see. Saturday morning looks good, perhaps into the afternoon for a time but late afternoon expect rain to move in. Sunday sees morning showers clear then a mix of sun and cloud for the rest of the day with southwesterly winds. Winds are lighter overall on Saturday, a little breezier on Sunday but nothing strong. Temperatures on Sunday may reach into the mid twenties, high's on Saturday will be in the low twenties. Will we ever get Summer in Chch ? Eventually, weather patterns are what they are, some summers are dry, some are wet, some are good or bad whatever your interpretation of that is. Have a great Xmas and New Year team -thank you for all your hard work and lets hope 2019 sees some well deserved funding for you guys!! Thankyou very much for the nice message, is much appreciated by the team. A low chance but more then likely no, instability is not looking as good for the Auckland area today. Could be an isolated shower or two perhaps. Beach Haven Auckland Rain Sat ??? I cleared the garden waited for the rain to pour down at some point on Sat so didn't refill pool! 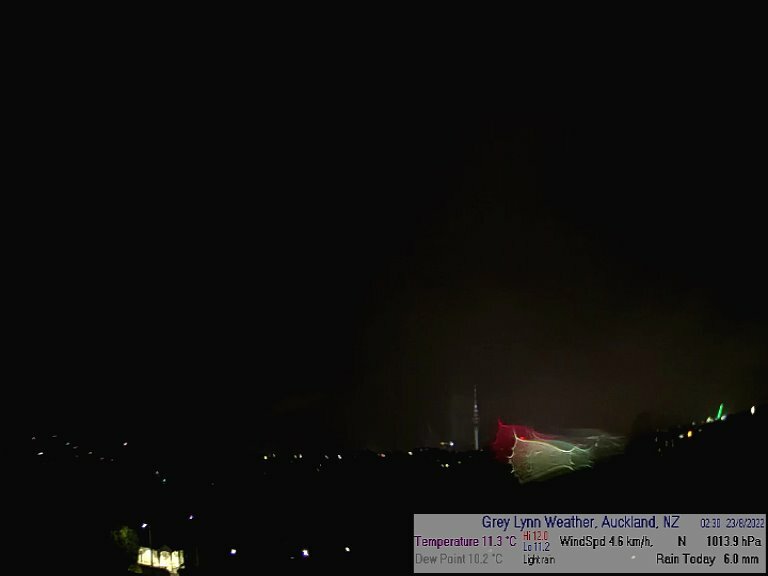 None came but seeing everywhere else in Auckland had storms the only one's we got were Friday night hardly any rain. So what happened? The nature of thunderstorms is they are often quite isolated meaning some areas may get heavy rain / downpours while other areas close by may see nothing at all. It depends where convergence lines form (where winds meet) and what side of the convergence is more dominant as to which side of the Auckland isthmus* clouds / storms form. Or winds may be equal either side meaning storms form right in the middle. Sometimes this is able to be sussed out in regards to what breeze may be more dominant but other times it can be a bit up in the air, excuse the pun. So when thunderstorms are forecast they are often mentioned as only a "risk" of happening as it can be hard to pin point where they may form. *An isthmus is a narrow piece of land connecting two larger areas across an expanse of water by which they are otherwise separated. Sorry our reply may be a little late, but you've probably realised we do have some thunderstorms - quite a bit flare up at the moment (10pm) but should taper off later. Might be more overnight and tomorrow too (like today, isolated but possibly big). Hi team between what time can we expect rain tomorrow in West Auckland and what time do you see it easing/clearing? Hi there, we have the right ingredients for big downpours, maybe thunder, but like today it may only affect a small portion of the region. This set up is a bit like cooking popcorn in the this analogy!). Keep an eye on our forecasts on Saturday, we tend to live update (which means every 30 mins or so) when the weather becomes unstable/changeable or high demand. Lots of thunder overhead here in Titirangi in past few mins, no rain as of yet. Is today the highest risk, or is there a higher risk of storms tomorrow? Hi there, good question as we've had a few risk days this week but the Friday/Saturday period was always most likely to be most active. Still some isolated thunderstorms in West Auckland this afternoon, Saturday has a a similar risk but there may be a few showers with no thunder too. Hey there, to be honest with you Auckland's forecast tomorrow is very tricky to be precise about as these sorts of downpours can bubble up over quite a large area but only affect a minority. Frustrating! At this stage it looks like there could be both mid to late morning and afternoon isolated downpours, possibly more likely in western Auckland and rural North and South. We'll be likely live updating our Auckland forecast on Saturday to stay on top of this so check back for updates. All the best with the hedge trimming - there should be some good dry spells around. There seems to be a tendency for most forecasts from other providers to be over forecasting .That is they seem to go for the worst case scenario ? Why do they do that ? NZ Herald are shockers for this. They will "cherry pick" comments from various reputable sources including Metservice and Weatherwatch and report them out of context to suit their dramatic headline. Hi there, this is due to them covering their backs basically, so they can say "see, we warned you" - but the downside is that you become the boy who cried wolf. Thunderstorms in NZ can be especially tricky to be precise about but extra care in the wording of forecasts, plus extra updates, can make a world of difference at reducing "big" forecasts and improving accuracy.